5 days of V/GF low waste meals - Yay for Earth challenge Round dos! 5 DAYS OF VEGAN/ GF /LOW WASTE MEALS - YAY FOR EARTH CHALLENGE ROUND DOS! There are a couple thoughts that go on in my head when I am writing this. The first one is noticing that I have not written in my blog since June and the second is that I have about 5 drafted topics waiting to be posted. Alas, I apparently cannot find anything more important than doing this dinner challenge again with Amanda (Mama Eats Plants)! If you want to see the first one to get a feel for what this challenge is about, do not look far and wide, just scroll right below this and its the last blog I posted, haha. Anyhow, I love that Amanda phrases it as a "free community offering" because not only is this meal plan free, but it brings us altogether every night from around the world. I feel social media can sometimes feel isolating but if we practice these types of things often, we can feel like a family! This is why its important you hashtag #yayforearthchallenge when you are on board with us so we can check out what you make! Please don't think you need to make every single meal, or that it has to be exactly the same recipe. Alter it freely and do it when you can! This is also up on the blog so you can make any of them anytime you'd like! optional: 2 cups dried basmati or other long grain rice, to make the curried lentil dish heartier- 1/2-1/3 cup dried per person. seasonings- I like chili flakes, harissa, cayenne or hot paprika (anything spicy) and salt and garlic. The spicy goes well with the sweetness of the soup. But please use whatever you like! 1 butternut squash or other orange fleshed sweet squash, or even sweet potatoes, mine was about 2 lbs. Cut into small cubes. 1 apple (any kind except don’t use a tart green one), cut into small cubes. 2.Toss chickpeas with drizzle of oil and seasonings, place on a single layer on a baking sheet. 3. Put chickpeas into the oven and set timer for 20 mins. 4. Meanwhile, in a large pot or dutch oven, heat up the oil and then add the onions. Sauté until softened and golden, about 10 minutes. 5. Add in the apple + thyme and sauté another minute or two till fragrant. Add in the butternut and veggie broth and simmer till tender, about 15 minutes. 6. Add the coconut milk and cook until heated through. Turn off heat and use an immersion blender or regular blender to puree. Taste and adjust seasoning as necessary. 7. 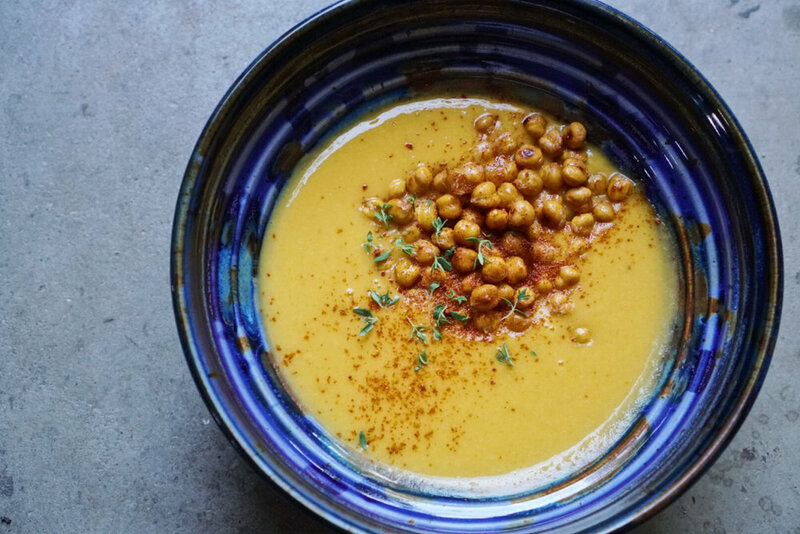 By this time the chickpeas should be ready, when ready to serve, add the chickpeas on top of the bowls of soup along with a sprinkle of fresh minced thyme. 8. Serve with a simple salad- I like arugula (1 large handful for every person eating) tossed with plenty of lemon juice and olive oil and either a sprinkle of vegan parm if I have it, or simple s+p. make it heartier: add a scoop of quinoa, rice, or serve with bread. make it faster: peel, deseed and cube the squash on the weekend. Store in a sealed container like a mason jar in the fridge. take it to the next level: roast the squash and then proceed with the recipe. this will deepen the flavor. less waste: rinse the seeds of the squash, pat them dry, and toss with seasonings and a bit of oil. Roast on a separate pan while the chickpeas are roasting for a nice snack. Picture from Shape mag. Not same recipe, but photo will be updated soon! NOTE: I would make the tzatiki (and the falafel mix if you want) an hour before eating or earlier if your schedule calls for it. Tzatziki consistency is best when refrigerated and falafel will be firmer for frying if refrigerated first. 1. Drain soaked cashews/sunflower seeds and rinse well. 2. Add to food processor or blender with 1/2 cup water and hemp seeds until smooth and creamy. 3. Add lemon juice, garlic, salt, and black pepper and blend until smooth. Add water if too thick. 4. Transfer into a bowl and add cucumber, fresh dill and mint. 2. Add lemon juice and salt and optional spices. 3. BADA BING BADA BOOM! Set aside. 1. In food processor or high speed blender, add chickpeas, oats, salt, garlic aquafaba, fresh parsley, red onion, paprika, cumin, and coriander and blend well. Taste and add more spices to your liking. If looks too moist, add more oats! Pop in fridge for 20 minutes to an hour for firmer texture. 2. Take bowl of falafel mix out of fridge and roll into balls. In skillet or frying pan with your high smoke point oil - drop balls in and rotate occasionally until light brown on all sides. 4. Assemble bowls - add spinach, carrot, cabbage, tomato, and onion. Add falafels, big scoop of tzatziki and drizzle tahini sauce all over and enjoy!!! 4. Place on a baking sheet and into the oven when its up to temp. and let cook until tender, about 25-30 minutes. 5. Heat up a dry skillet (no oil) till hot, add pumpkin seeds, and toast, shaking pan often, until they start to turn color and pop. Remove from heat and set aside. 11. Toss it all together and taste. Adjust as needed and set aside. 12. Chop the remaining 1/2 onion finely and heat up some oil in a pot. Now, assemble the bowls with the sweet potatoes, black beans, and slaw. Add avocado on top and sprinkle over the pumpkin seeds. Enjoy! This photo is the same thing but with different cheese! The alfredo will be marinated with the noodles with the following recipe! YUM! NOTE: I went ahead and added the directions in the order it should be made in. There are a few parts to this recipe and I find that its a lot easier to make each part in this order! Read over it and adjust if you need. 1. In a saucepan, add olive oil, chopped red onion, maple syrup, salt, pepper and paprika. Let caramelize on medium low while stirring frequently for 5-8 minutes. 2. Rinse lentils and then add lentils to saucepan with the onions. Toss frequently and let simmer for 5 minutes. 3. Add 2.5 cups water and bring to boil. Reduce boil and let simmer for 30 minutes stirring occasionally. 4. While lentils are simmering, grab big bowl and add 1 cup gf oat flour in along with the thyme, dried oregano, paprika, cumin, chili powder, salt and cayenne. 5. When lentils are ready (they should be soft consistency and not watery), pour into the oat mixture bowl. 6. Add aquafaba and coconut amigos. Mix altogether really well. 7. Pop bowl in refrigerator for about 10-15 minutes. NOTE: I do this before the alfredo because I don't have enough pans. After I sauté these, I set aside in a bowl. 1. Add olive oil and mushrooms to a pan with salt, pepper, and thyme and then cover. 2. Let simmer. The key is slow and steady - if you cook mushrooms too fast they can turn out gummy. 3. Stir occasionally until they are soft, yet lightly crispy. Work on alfredo sauce now! 1. Drain soaked cashews and add them into a blender with 2.5 cups water, nutritional yeast, and salt. After blending, leave mixture in blender. 2. In a skillet or sauce pan, put in your chopped garlic and your oil and let simmer on medium until garlic starts to brown a little. 3. Add in cooking white wine (careful it may pop!) and let the wine reduce in half. 4. Then add cornstarch and stir - it will be clumpy! 5. Add your coconut milk (or other milk) and stir and then transfer it into the blender where your cashew mix is. 6. Blend altogether! Now transfer it back to same skillet or deep pan after mixed and reduce to lowest setting (not boiling at all). 1. Start boiling water for your pasta at this time. Whenever it starts to boil - add pasta. 2. Take lentil oat spice mix out of refrigerator and roll into balls (any size you'd like). 3. In a frying pan, add the grapeseed or avocado oil (or your high smoke point oil) and turn heat onto medium. 4. Add the meatballs and turn them every now and then - should be light brown and crispy all around. You will have to turn them occasionally. 5. When pasta is done, drain and throw into the alfredo already in the skillet/deep pan. Toss well until pasta is coated. 6. Add mushrooms and stir also. DONE! 7. Put into bowl or plate and top with meatballs, basil and fresh tomato! Voila! 1. Heat oil in a medium saucepan over medium. Cook onion, stirring often, until softened and golden brown, 8–10 minutes. 2. Add garlic, ginger, curry powder, and red pepper flakes and cook, stirring, until fragrant, about 2 minutes. Add lentils and cook, stirring, 1 minute. 3. Add tomatoes, ½ cup cilantro, a generous pinch of salt, and 2½ cups water; season with pepper. Set aside ¼ cup coconut milk for serving and add remaining coconut milk to saucepan. 4. Bring mixture to a boil; reduce heat and simmer gently, stirring occasionally, until lentils are soft but not mushy, 20–25 minutes. Season soup with more salt and pepper if needed. To serve, divide soup among bowls. 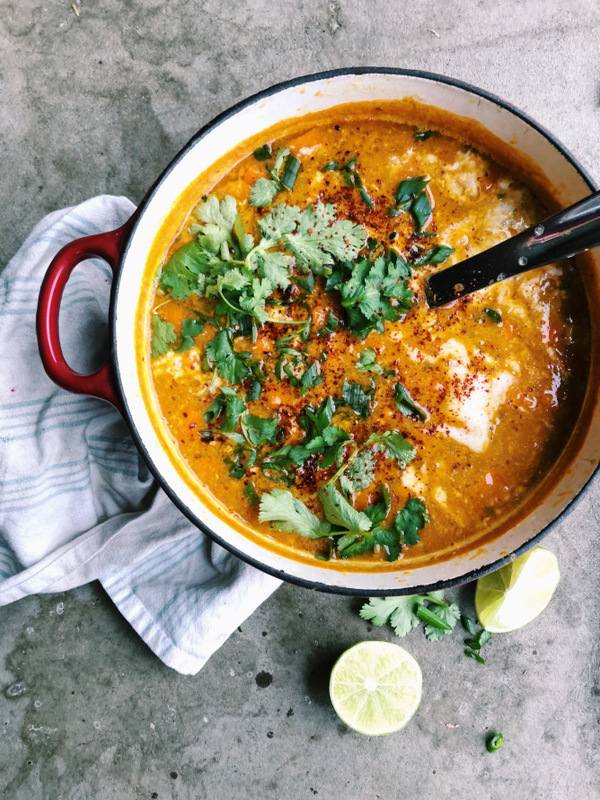 Drizzle with reserved coconut milk and top with more cilantro. Serve with lime wedges. 2. In blender or food processor - add oats, brown sugar/coconut sugar, cocoa powder, cinnamon and salt (or any other optional dry ingredients) and pulse a few times to combine it all and chop a bit - if you pulse too much, its too fine. Add more oats if necessary. Transfer into big bowl. 3. In a saucepan, heat up oil and maple syrup until well combined. Once liquids are melted, pour over gluten free oats, add vanilla and stir well. 5. Pour the mix into a silicone reusable baking mat, parchment paper or well oiled baking sheet and pop in oven for 20-26 minutes! 6. Let cool, pour into a big bowl and add chocolate chips. 1. In a food processor, blender or other type of mixer (should function well), add all the ingredients. Start off with 1/4 cup of the milk and blend. If its too thick to blend, add more milk. Should resemble soft serve so less milk the better. Note: If you accidentally added too much milk - add a couple ice cubes or enjoy it as a smoothie form. Top nice cream with granola and enjoy!!!! Note: Peel and freeze your bananas, freeze your blueberries, and optional to dice and freeze the zucchini!! 1. Blend all ingredients together until smooth and creamy and enjoy! Top with granola or your favorite nut butter if you want yum!